2. In a small bowl, sprinkle the gelatine over the 1/4 cup of cold water. Set aside. 3. In a medium bowl, beat the egg yolks until smooth. Set aside. 4. 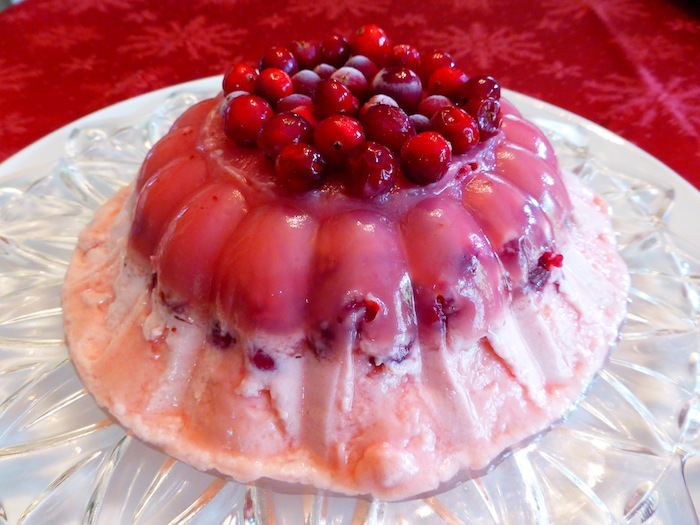 In a medium saucepan, whisk the orange juice, lemon juice, lemon rind, 2/3 cup of sugar and the cranberries together. Bring to a boil and then reduce the heat and simmer until the cranberries begin to burst, stirring frequently. Remove from heat and strain the juice into a large bowl, setting the cranberries aside. Add the egg yolks, gelatin and almond extract and whisk until the gelatin is dissolved. Cool to room temperature. 5. In a clean, dry bowl beat the egg whites with the cream of tartar until soft peaks form. Gradually add the 1/3 cup of sugar and beat until stiff peaks form. 6. In a clean bowl beat the cream until stiff peaks form. 7. Stir 1/3 of the meringue into the juice mixture to lighten it. Then gently fold the remaining meringue and the whipped cream into the mixture. Carefully fold in the cranberries. 8. Pour into the prepared mold and freeze overnight. Remove from freezer and let stand 20 minutes before serving.